Learn about the dissolution stages followed during the failure of the sample using the six dosage form units. Dissolution test is done to verify the release of drug in the solution from the tablet because of binders, granulation, mixing and the coating may affect the release of drug from tablets. The amount of dissolved active ingredient is known as Q in the dissolution test. The limit of Q may be different in different monographs according to the nature of the formulation and its active ingredients. Dissolution test is done using 6 units or dosage forms. These dosages forms are run for the specified time period, sampled and analyzed for the dissolved amount of active ingredient in percentage. This is the first stage of the dissolution and known as S1 Stage. In S1 stage dissolved amount of each unit should not be less than Q+5%. It shows that every unit should be above 5% of the specified limit in the individual monograph. If any of the units is found below this limit then we have to analyze the sample in the S2 stage. Six additional units are also tested for the dissolved content. Now the average of all 12 units should not be less than Q and no unit should be less than Q-15%. It gives some flexibility to the test results. Average should be equal to or more than Q but some units may below the Q. If any unit is found below the Q-15 or average of all units is less than Q then the sample is analyzed in the S3 stage. Twelve more units are also analyzed for the dissolved active content. At this stage the average of all 24 units should not be less than Q, only two units may below the Q-15% and no unit should be less than Q-25%. This stage gives more flexibility to the sample because the average of 24 units should be equal to or more than Q but two units may up to Q-25. Dissolution stages give the flexibility to the sample that is unable to pass the dissolution test. These stages are accepted by all regulatory bodies. 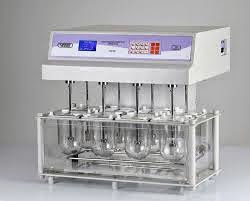 Hence, it is a widely accepted test method for the dissolution of solid dosage forms. These articles were very informative. Nicely explained.. dissolution criteria thanks sir.. Thanks for providing useful information. Helpful for learners. Keep posting of similar posts. Why should we use only 2mm or #10 mesh in dissolution basket...?? is there any guideline?? Yes, it is given in pharmacopoeia. Why we use only 6 apertures in baskets or 6 dosage units in dissolution tests...?? Why can't we take more than 6 if we take it's better to provide the reproducibility of the system...Does it make sense?? Pharmacopoeia says to take 6 tablets for dissolution. How to calculate Q ? It's depend on formulation & different products. Any example & calculation. good and very informative but this guideline applicable in product development stage? This guideline is applicable in product development stage? If 6 tablets in S1 stage shows Q less than 25% the. Is it necessarg to carry the test to S3 or not ?